Note: We do not deal in retail value & our minimum order value(MOV) is $500. By keeping track with the latest fashion trends, we are bringing forward an attractive range of Designer Kada. 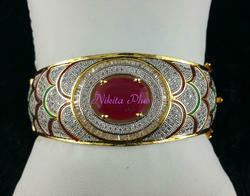 The offered designer kada is highly appreciated by our customers for their traditional as well as contemporary designs. Only premium quality basic material is used while designing the offered kada by adroit professionals so that we deliver only high quality product to our respected clients. 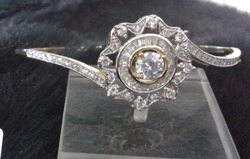 Furthermore, our offered designer kada is provided in proper packaging for assuring its quality. With enormous experience in this domain, we have established ourselves as the most reliable manufacturer, wholesaler & exporter of Designer Kada. Our offered kada is perfect to worn with saree, salwar kameez and western dress in order to give an alluring look to the wearer and signify the old tradition and culture. The offered kada is accessible in diverse designs & customized shapes keeping in mind the customer’s requirements. 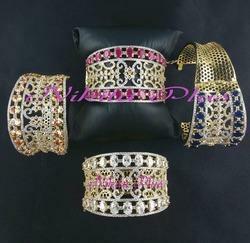 From our wide range of products, we are offering a classy range of Elegant Kada. 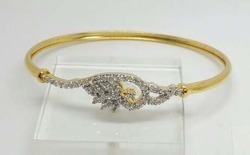 Offered kada is artistically designed under the proper guidance of our diligent team of professionals using modern tools and technology using excellent quality basic materials. 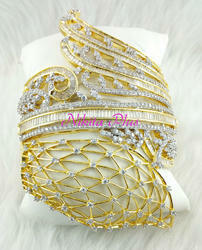 Our kada is available in numerous designs & sizes according to the needs of customers. This kada is perfect to worn with saree, salwar kameez and western dress in order to give an alluring look to the wearer and signify the old tradition and culture. In order to accomplish specific demands of our customers, our organization has come up with a huge gamut of beautifully designed Stylish Kada. 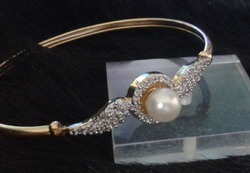 Our kada is broadly treasured and accepted by our customers for their stylish designs and excellent looks. The entire range of products designed by our experts is highly praised in the market because of its superb quality and superior finish. 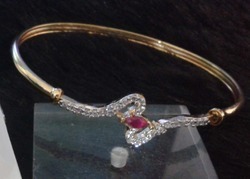 We offer this kada as per the requirements of the patrons at reasonable rates. We offer a collection of different kinds of kadas that vary in terms of design, size, make, stones, etc. The eye-catching colors and smooth finish of the stones impart a colorful, shiny and bright look to the kada.